If you didn’t believe that VOIP is one of the most promising new business opportunities available right now, you probably wouldn’t be visiting our site. We all know that the opportunity is there, but it can be confusing to know just exactly how to go about setting up your website and finding new customers. That’s where our Globalink can help you. For more information on how we can help you get your new VOIP business up and running, please contact us today. SMS International Callback for World Travellers —-what is it? Would you like to experience the USA’s lowest-in-the-world long distance services, no matter where in the world you are calling from? 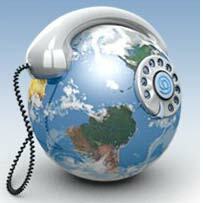 It’s now possible with SMS International Callback services from Globalink. We are able to route all your international calls through the U.S. (and a few other strategically-placed worldwide sites), you can call anywhere in the world for the LOWER RATES of the U.S. phone system, no matter where you call from. After you sign up with Globalink, we assign you a special unlisted U.S. phone number that you will call and then hang up after one ring. Since you hang up BEFORE a connecting answer, there is no charge for the call from your national or local phone company. However, our computer has been signaled that you called and it will IMMEDIATELY call you back. Then, you make your call to anywhere in the world for the lower US rates. It is a great service for beating the high prices of making calls from outside of America and it is often cheaper than even our Calling Card service. SMS International callback has become the newest technology to help foreign companies and individuals drastically reduce their cost for international calling. This reduction in costs for international calling allows companies to be more competitive in the international marketplace. It also allows individuals to stay more in contact with friends and family members. VOIP for Superior Communications Technology Solutions, Not Just Cheap Phone Service. Sometimes as sellers and resellers of voip services, we get caught up in telling consumers about saving money on their phone services with voip, but we should remember there are a lot of other benefits to using this superior new voip technology for communication services. The newest frontier area of VOIP appears to be determining how it will go mobile. Cellular companies offer dual-band cellular or wifi phones that will work in wifi hotspots part of the time, and use cellular service when wifi is not available. Its a wide-open area right now, as new technologies will compete to try to give the consumer the most practical, easiest-to-use solution. The most promising thing about the whole idea of voip going mobile is that it can help make VOIP services something that consumer are more likely to think of as just another phone service, and not as a scary-new-hi-tech adventure to be avoided. Visit our Globalink APP site and see not only the new offers, but new ideas that you can use in your own VOIP reseller business. You’ll find information on updated services and options. You can sign up as a private-label reseller, just like always.